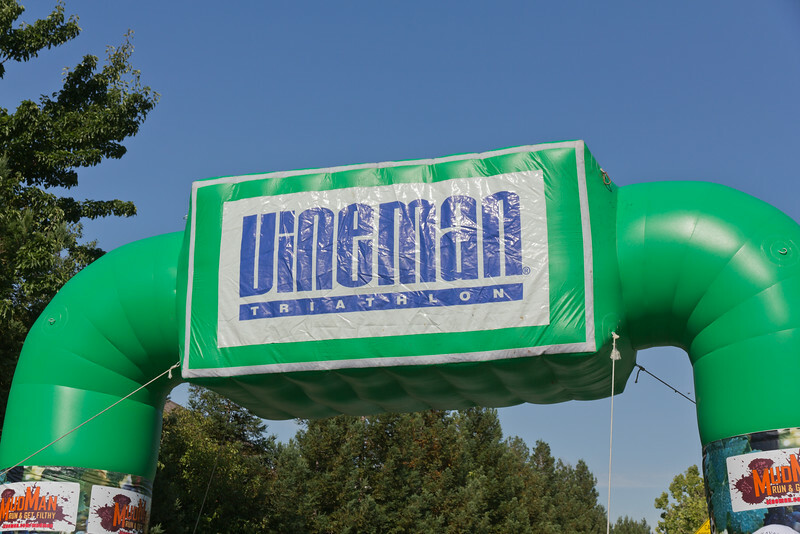 On July 14th, I participated in the Ironman 70.3 Vineman triathlon, which consisted of a 1.2 mile swim, 56 mile bike and 13.1 mile run in Sonoma County. I participated in this race last year as well. Significantly, thanks to generous donations of my friends, I was able to raise $692 for Building Bridges Worldwide, a not-for-profit organization committed to constructing schools, orphanages, clean water wells, medical clinics, and bridges in impoverished communities around the world. 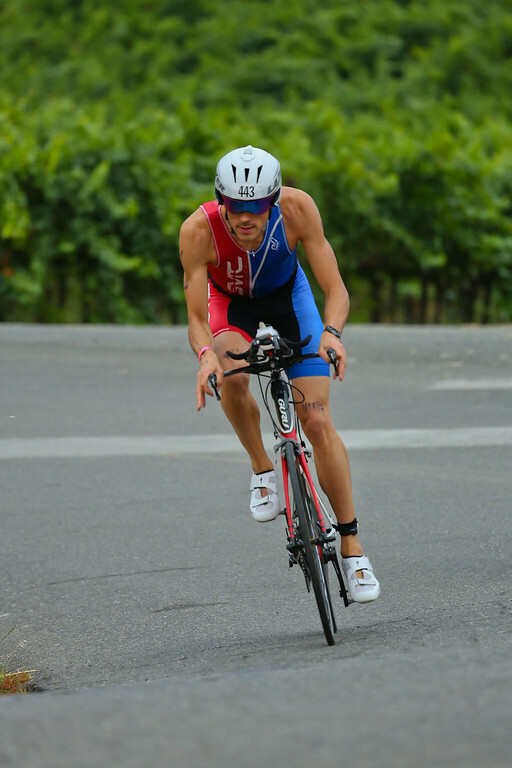 At the end of the day, I was extremely pleased with my results at Vineman 70.3 this year. 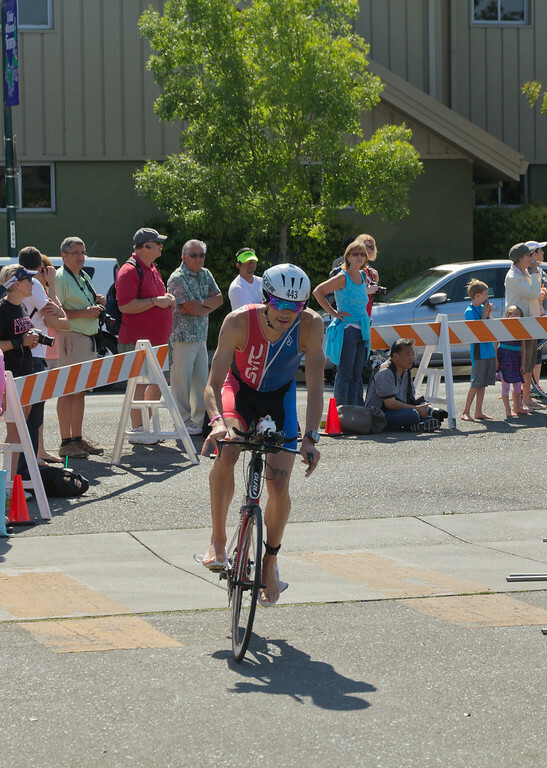 I had a total time of 5:01:12, with the following splits: (i) 34:39 swim, (ii) 2:37 T1, (iii) 2:40:51 bike, (iv) 3:02 T2 and (v) 1:40:03 run. I was so close to breaking the 5 hour mark, and definitely have that in me as I seem to always be improving by training harder and more efficiently. For instance, my time of 5:01:12 was a nice improvement over my time at Ironman 70.3 Hawaii this year of 5:17:57, but that is not apples to apples given Hawaii is a tough course. 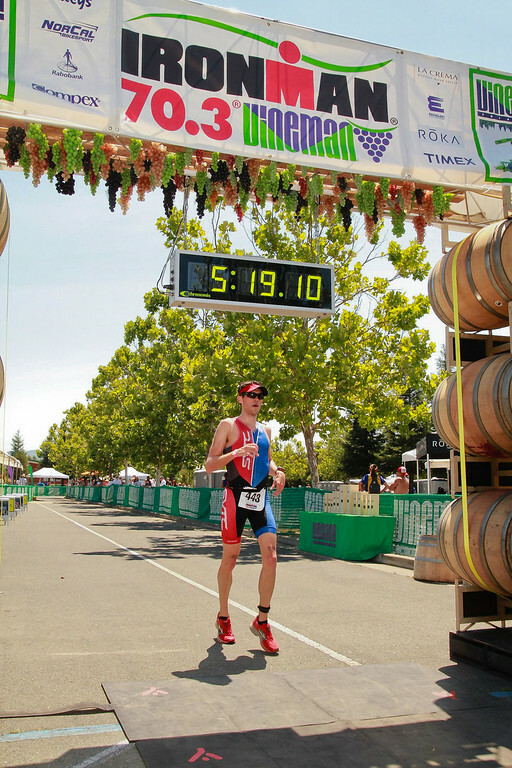 So when comparing to my time at Ironman 70.3 Vineman last year (5:38:29), it was a huge improvement! 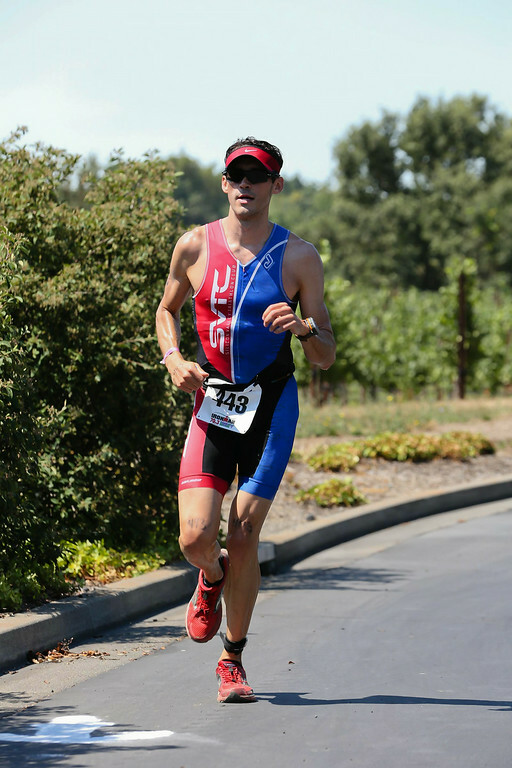 Fortunately, this year I did not have major interruptions in my training leading up to the race like I did last year (where I went into Vineman 70.3 as a sub-optimal fitness level where I wanted to be). 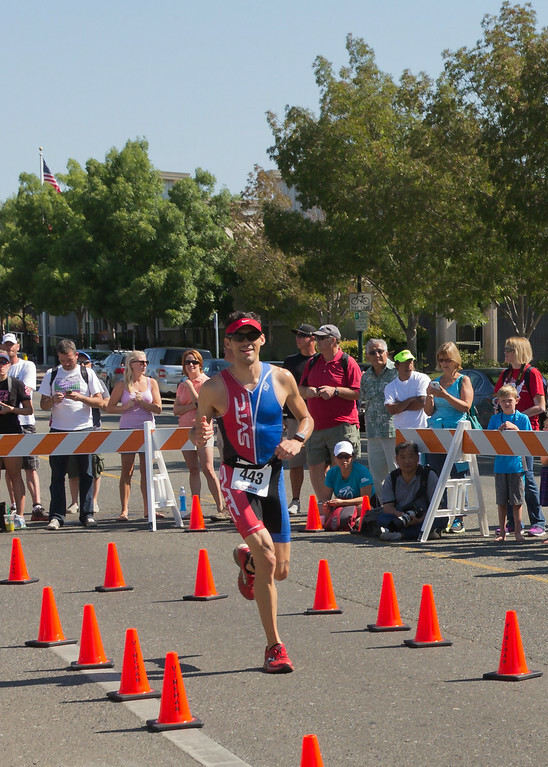 In addition to my regular training between Hawaii and Vineman, I did a sprint triathlon, which was fun as I had never done a sprint-distance race. 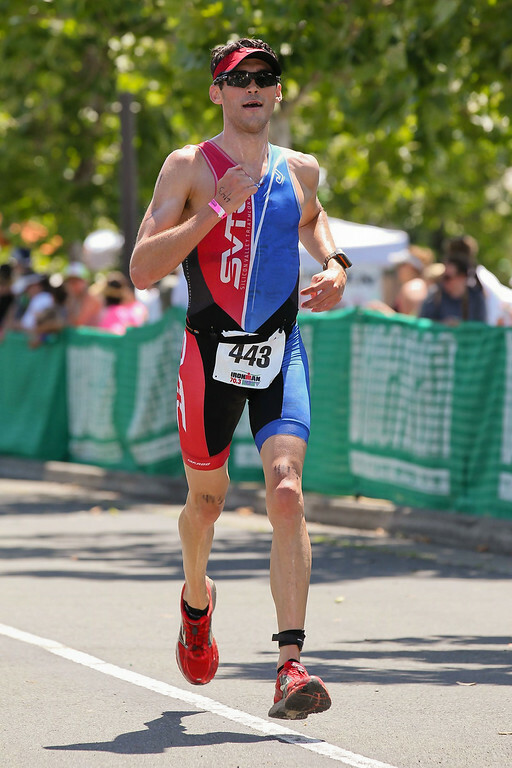 It was cool to break-up the long-course training with something complete anaerobic and going redline the entire race. 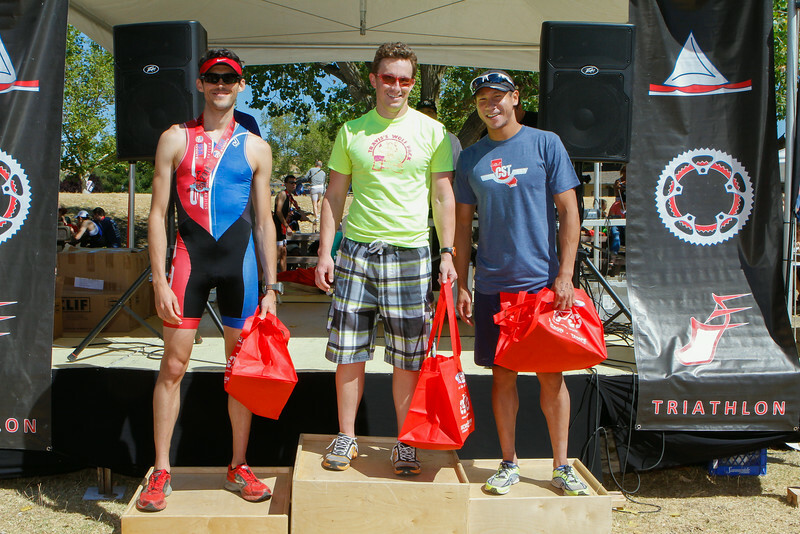 I even managed to grab a third-place podium spot in my age group in that race. 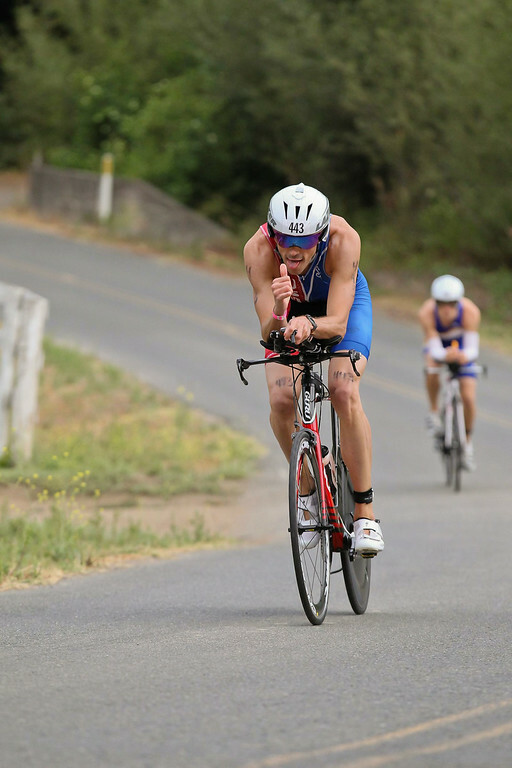 What is amazing about Vineman 70.3, however, is how unbelievably competitive it is – which is not entirely expected given this race sells out the November prior in about 4 minutes online! Based on my total time of 5:01:12, I ended up (i) 44/200 finishers in my age group (22%), (ii) 175/1360 male finishers in the race (12.9%) and (iii) 202/2174 total finishers in the race (9.3%). Unlike last year, my age group wave went early as the 4th wave leaving at 6:48 AM (with the Pro Men wave starting the race at 6:30 AM). This was great as it meant that the bike and run course would be much less congested (as my wave last year was second to last and over two hours after the first wave went), and the heat of the day would not be as bad. 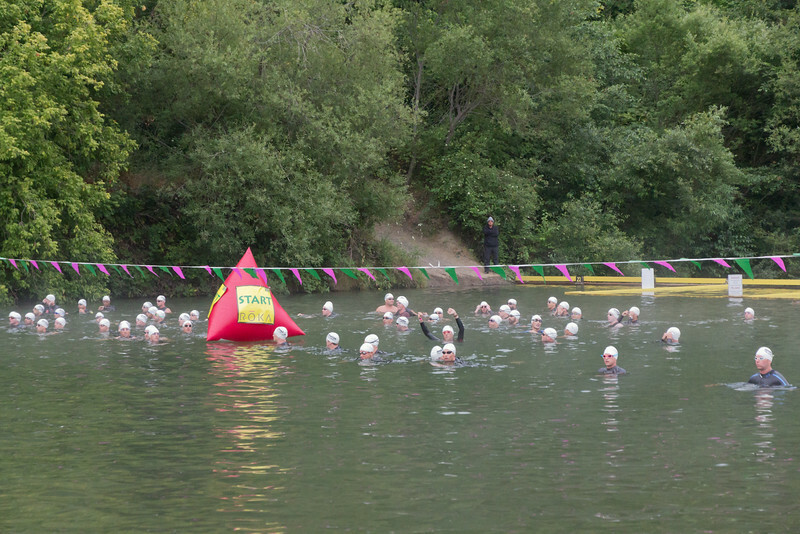 So we headed over the swim course and T1 at Johnson’s Beach in Guerneville. We had arrived about an hour and a half before my wave went off, so I had plenty of time to set up my first transition zone and watch the Pro Men and Women take out. I then got to put on the wetsuit and get mentally ready for the next 5 hours. Six minutes before my wave started we were able to get in the water and warm up a bit and get ready. 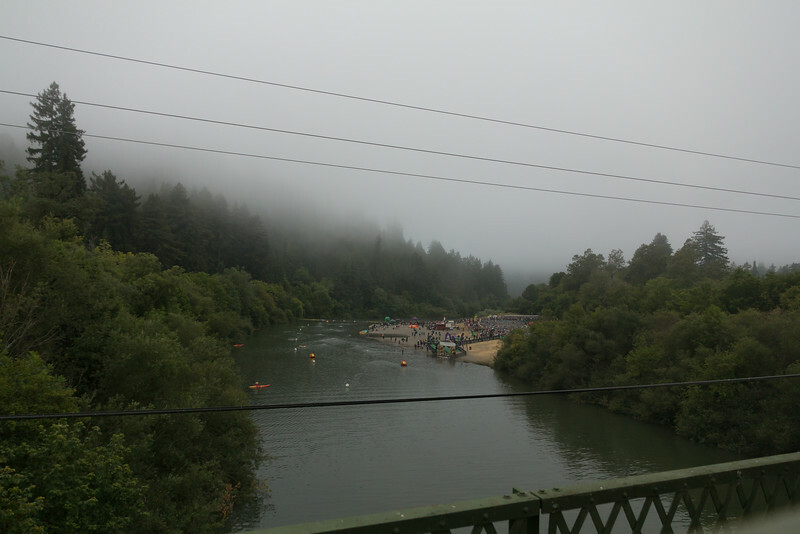 The Russian River is nice and warm and barely wetsuit legal, so it felt really good to get in the water. Sarah got this funny shot of a part of our wave in the water, and you can see me fooling around in the middle with my hands up! After the horn went out, we were off. 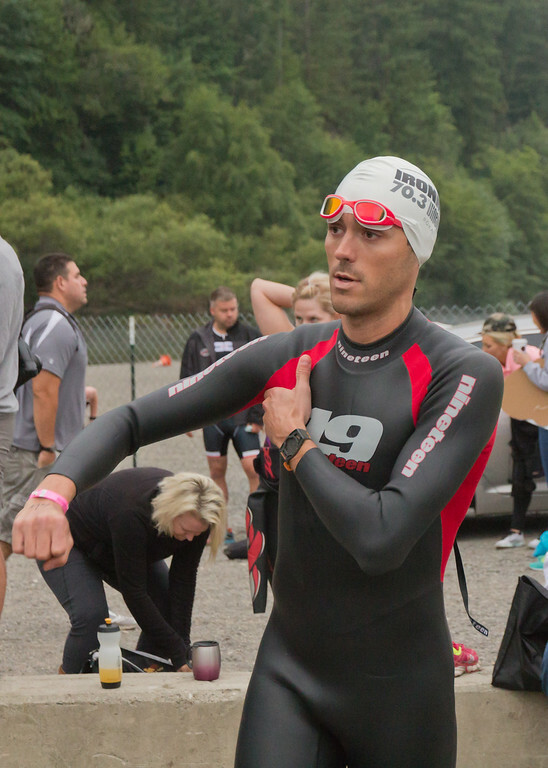 My plan this year was very similar to Ironman 70.3 Hawaii in that I lined up mid-pack towards the front and really tried to go out slow and just gradually build speed throughout the swim. 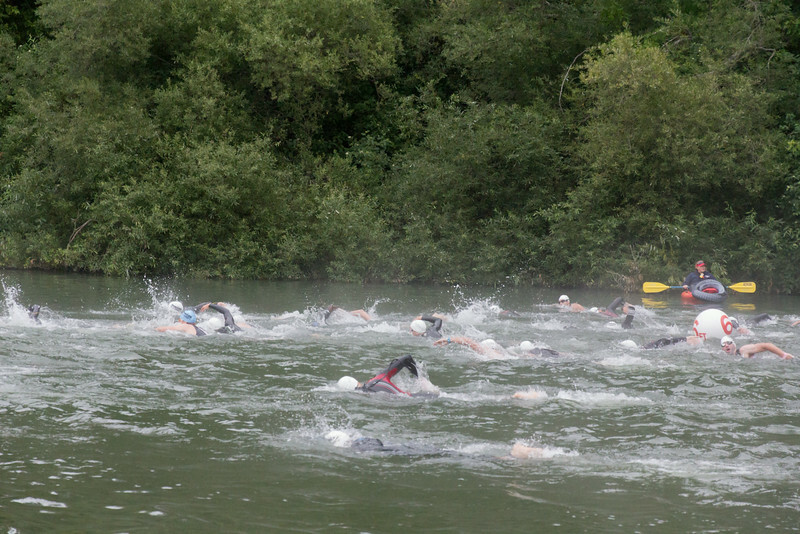 The swim at Vineman 70.3 is an out and back swim course of 1.2 miles, with water depth pretty shallow (i.e., you can likely stand up at most points in the river). Fortunately it is dam-controlled in the summer so the droughts here in California were not an issue, but the water was still low like each year. There is a section near the turn-around point that gets very shallow that some people walk. I just dolphin-dived for a short bit (which is much faster than walking) and otherwise was more or less able to swim the entire way (with some dirt grabbing underwater in a couple of spots). I had a pretty fast T1 with the wetsuit (actually faster than my T2 somehow) and then the long run out to the exit of the transition zone. At Vineman you are prohibited from having your shoes already in your pedals, so I had to put them on and run in them. From the swim exit there is a hill leaving T1, which is short and I just ran to the top of and started biking from there. 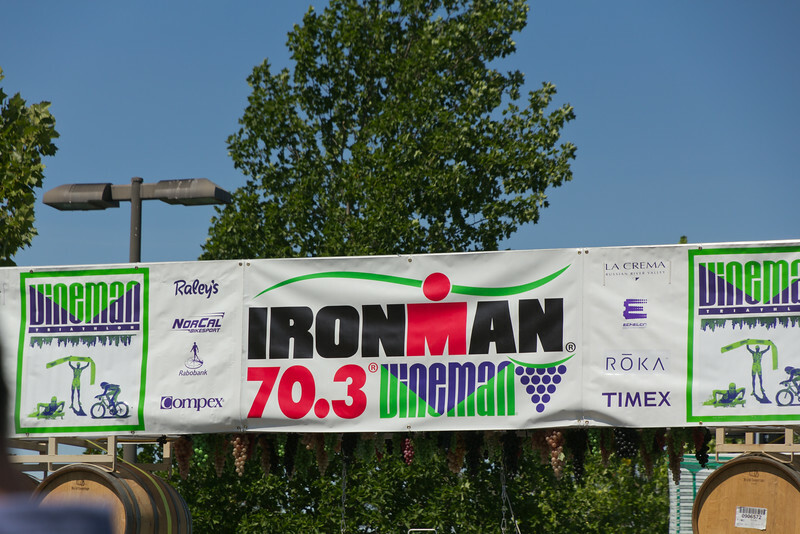 My nutrition strategy was the exact same as Ironman 70.3 Hawaii and I think I have it dialed for my needs in the half-ironman distance. In my down tube I have an xLab aero bottle with seven scoops of Hammer Nutrition Sustained Energy (unflavored), and two NuuN tablets. This is a “three hour” bottle that gives me enough calories for 3 hours on the bike, which I take a proportionate sip from every 15 minutes on the ride. I like the unflavored version as it is not sweet, and then I add the two NuuN tablets (which are electrolyte tablets) for the slightest hint of flavor without it being too sweet. The entire bottle contains 756 calories, with a 7:1 carb to protein ratio (and the slightest hint of fat). I got it very cold in the freezer the morning of the race so that it would be thawing as the bike leg started and it would stay cold during the ride. Separately, I have an xLab torpedo bottle between my arms on the aero bars that I use for hydration and electrolytes. I start with it filled with approximately 22 oz of water and one NuuN tablet, and drink that over the course of just under an hour. At mile 18 when going through the first aid station, I grabbed a water bottle from a volunteer and refill my torpedo bottle and drop a NuuN tablet. Repeat the next hour until the last aid station at mile 40 (and same process again). It is easy to rely on the on-course water handups at the aid stations and just add some electrolytes. The above works very well for me and I feel plenty hydrated and with energy, with no gastric issues. I fished up the bike with a split of 2:40:51, which equated to an average pace of 20.9 mph. After the bike, I had moved up to 315/2174 finishers overall and 54/200 finishers in the men’s 30-34 age group. T2 is at Windsor High School, and Sarah had driven over from T1 while I was out on the bike. Sarah got a shot of me coming in off the bike, ready for the flying dismount with the feet out of the pedals. 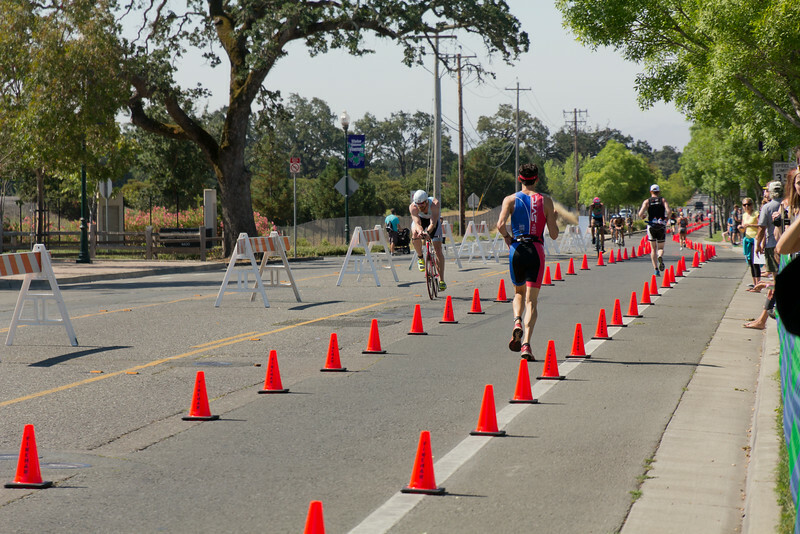 In T2 there is a bit of a long run with your bike to the racking zone, but it is pretty well organized. I lathered on some sunscreen and headed out for the run. My legs felt really good and I knew I had paced the bike well. 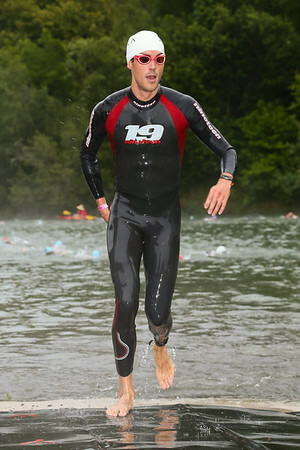 It was cool being in an early wave from the swim and pushing the pace pretty good, as it meant the course was not congested out in front of me. Heading out on the run. Ultimately, the plan worked out very well (with the hills thrown in making it difficult to truly negative split, but generally I did). My average pace for (i) miles 1-4.3 was 7:59/mile, (ii) miles 4.3-6.5 was 8:11/mile, (iii) miles 6.5-8.2 was 7:09/mile, (iv) miles 8.2-10.2 was 7:41/mile, (v) miles 10.2-13.1 was 7:00/mile. My total average split for the 13.1 mile run ended up 7:39/mile, in a time of 1:40:03. I had moved up to up to 202/2174 finishers overall and 44/200 finishers in the men’s 30-34 age group. When Sarah told me I was at 5:01, I immediately started the mental game of figuring out where I could have shed a minute to go sub-5. Regardless, my goal next 70.3 distance is definitely 4:45! The best part of the race was finishing and seeing Sarah in her “Nick’s Fan Club” hat!